Prime oceanside real estate lets you go from suite to sand in minutes. Between the waterslide, tropical landscaping and ample loungers, it's pretty easy to lose track of time at the pool. Sprawling lawns peppered with botanical gardens and lava rock ponds make for a seriously snap-worthy resort. Bright white walls, deep dark trims, wicker furnishings - this is Hawaiian decor done right. 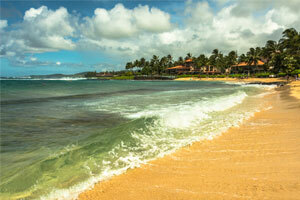 Located right on beautiful Poipu Beach. Walk to Kiahuna Golf Club in just 11 minutes and swing the day away. Sprawling lawns and exotic gardens make the perfect backdrop for a serene getaway. Swaying palms, lava rock ponds and botanical gardens make for a true tropical paradise. Homey and historical, exciting yet peaceful, modern but traditional - this Kauai condo resort has everything going for it! Kiahuna Plantation Resort was built on the site of Hawaii’s very first sugar farm, the Koloa Plantation, which is now thirty acres of sprawling lawns and lush foliage peppered with swaying coconut palms and lava rock ponds. Begin your day with a leisurely stroll through the Moir Botanical Garden to admire exotic orchids and rare cacti species before hitting the water with the crew. Stop by the Beach Hut to pick up complimentary towels, chairs and boogie boards and just waltz out onto the sand - the beach is right there! Work on your sunkissed glow with that bestselling paperback you’re finally reading while the kiddos build sandcastles and splash around in the surf. If your crew is more into freshwater fun, head to the outdoor pool where tykes go giddy for the waterslide (and adults can appreciate the lovely landscaping). Kiahuna Plantation is prime for all kinds of relaxing, but sporty types will be happy to know there’s tennis courts onsite - with complimentary raquet rentals - and the Kiahuna Golf Course just across the street! Wow the foodies in your crew by loading up on local produce and fresh caught fish (the Koloa Farmer’s Market and Kauai Culinary Markets are both nearby) and grilling up an island feast at the communal barbecues as the sun sets on the Pacific. Just be sure to save one night for a dinner date at the upscale onsite restaurant Plantation Gardens to indulge in specialty drinks, pupu platters, and gourmet island cuisine. Spacious one- and two-bedroom condo suites are done up in authentic island style, with traditional plantation design and decor featuring bright whitewash walls and elegant wood furnishings - all with a personal furnished lanai prime for sipping morning coffee in the fresh air. Fully equipped in-suite kitchens let you cook up whatever your crew is craving (also handy for midnight munchies), while a separate living area with flat screen TV and cushy couch makes an inviting place for just hanging out as a family. From body surfing at Poipu Beach to sailing charters out of Hanapepe Bay, Kiahuna Plantation puts you in the perfect spot for all of the oceanic adventures Hawaii is famous for. For some retail therapy you need only walk over to the Poipu Shopping Village to peruse an array of souvenir shops and fun boutiques. Feel like exploring beyond the southern shore? Head inland to try exciting excursions like zip lines and ATV tours. Or, experience Kauai’s natural beauty and rich history by taking a day to drive along Holo Holo Koloa Scenic Byway and check out gotta-see spots like the Maluhia Tree Tunnel, Puhi Spouting Horn, and ancient Kaihalulu Heiau temple. - Front desk for Kiahuna Plantation Resort Kauai by Outrigger is located at 2253 Poipu Rd Koloa HI 96756, by Plantation Gardens Restaurant and Bar. This property charges a USD 75.00 non-refundable deposit that is due within 24 hours of booking the reservation. For more details, please contact the office using the information on the reservation confirmation received after booking.